Botox or Botulinum toxin is the toxic compound produced by the bacterium Clostridium Botulinum. Botox is a procedure whereby an injectable substance that is a medical grade form of the botulinum toxin is used in treating signs of aging. Botox procedure is known as one of the best ways to effectively remove or reduce wrinkles. Botox injections have been recognised and approved by the Food and Drug Administration (FDA) for most common cosmetic procedures performed today. The vast majority of botox treatments are usually performed in these 3 areas of the face: crow’s feet line around the eyes, vertical lines between the eyebrows, and horizontal forehead furrows. Botox can produce a phenomenal improvement in an individual’s appearance and enhance facial rejuvenation because it has been proven to be the best non-surgical procedure. The presence of large wrinkles or furrows in your forehead. Vertical ‘’frown line’’ usually seen between the eyebrows. Excessive wrinkles in the face. Some wrinkles or ‘crow’s feet” around the eyes. The primary function of the Botox procedure is to alter the muscles beneath the skin around the face that are associated with wrinkles. A local anaesthetic cream is applied to the skin before the commencement of the procedure. When the procedure is completed, ice will be applied immediately. 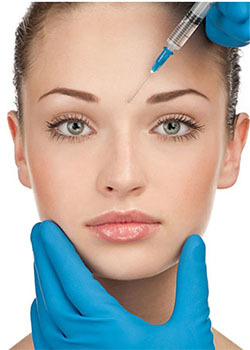 Botox procedure involves injecting a small amount Botox into the area of the face that has wrinkles. Botox helps to relax the facial muscles as they block the impulses from the nerve. The skin of the face begins to smoothen out as the facial muscles relax. Patient may likely repeat treatment after three to six months because that is when the effect of the treatment reduces. The procedure does not take a lot of time. In a few minutes, they are done, and the patient can go about their normal duties. The length and intensity of the recovery period may be reduced if patients follow the guidelines after the procedure. These guidelines include avoiding applying cosmetics, engaging in heavy physical exercise and lying flat on the abdomen within 4 hours after the procedure. Avoid massaging or rubbing the area of the face within 24 hours after the procedure. Some other important uses of Botox are to relieve migraine, incontinence, and excessive underarm sweating. It has even been used to treat patients who are cross eyed. Botox is not limited to treating these ailments as its ability to paralyze muscles can definitely provide treatment to various medical conditions.